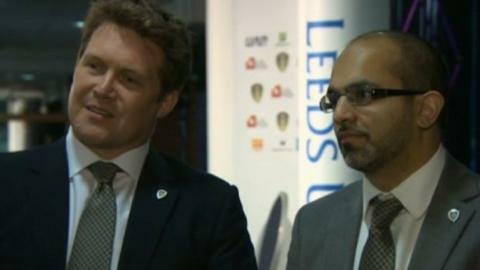 Leeds United owners GFH Capital have asked fans to be patient as they look to secure new investment in the club. GFH say they are not interested in selling a controlling share in the club and rejected a bid from an unnamed individual last week. The Dubai-based private equity group took over at Elland Road in December. "They're consistent with their message that they don't owe Ken Bates anything. "It would have been nice if they had expanded on some of their answers, especially about the cash flow and the managerial situation. "It is a positive that they are looking for new investment and fans may be encouraged to hear this." They told BBC Radio Leeds: "Please be patient. We can only be responsible for the future, and we can only be successful if the club is successful." In an email correspondence, the owners revealed that they are not interested in selling a controlling share in the club and that the rejected bid came from someone whose backing was unknown. Their protracted takeover, which began when Leeds announced they were in investment talks in May, has seen previous owner Ken Bates remain in the position of chairman until the end of this season before becoming honorary president thereafter. Some supporters have been concerned that Bates could yet step back into a more active role with the club but GFH say this will not be happening. "Ken Bates cannot regain control of the club under the terms of the agreement that we have signed with him," they added. Following Sunday's FA Cup defeat by Manchester City, manager Neil Warnock admitted that he did not expect to still be in charge at the the club next season unless they gain promotion. Warnock's contract is up at the end of the current campaign but GFH say they have not contacted anyone about succeeding the 64-year-old. "We have not yet spoken to anyone regarding the manager's position," they said. "As everyone is aware, Neil Warnock is under contract until the end of the season, and it would be wrong of us to discuss his future publicly at this time." Leeds, who take on Blackpool in the Championship on Wednesday, are currently 13th in the league, nine points off the play-offs.